Analysis on mining returns: basically, the break-even period for most of the coins is getting longer, except Zec and Dash. It is well known that there are three major factors influencing the break-even period for crypto mining: coin price, the whole network hashrate and mining rigs price. The shorter the break-even period, the more profitable the mining business, the higher likely that the large capital players join the mining industry. When the mining profits are not sufficient to cover the cost, most miners may shut down their machines and eventually lead to mining disaster. In January (01–01–2019 to 31–01–2019), the cryptocurrency market capitalizations were oscillating between 100 to 130 billion dollars. Among the top ten mining cyptocurrencies, nine of them experienced a decline, apart from the LTC, which increased by 4%. The price changed on average -13% for the top ten coins. Generally speaking, if the prices fall, it will take longer to reach the break-even point. Theoretically, the proportion of the hashpower controlled by the miner against the whole network hashpower determines the success rate of the mining, and the higher this proportion, the greater the likelihood that the miner will receive blockchain rewards. Moreover, the increase of the whole network hashpower will lead to the increase of mining difficulty. 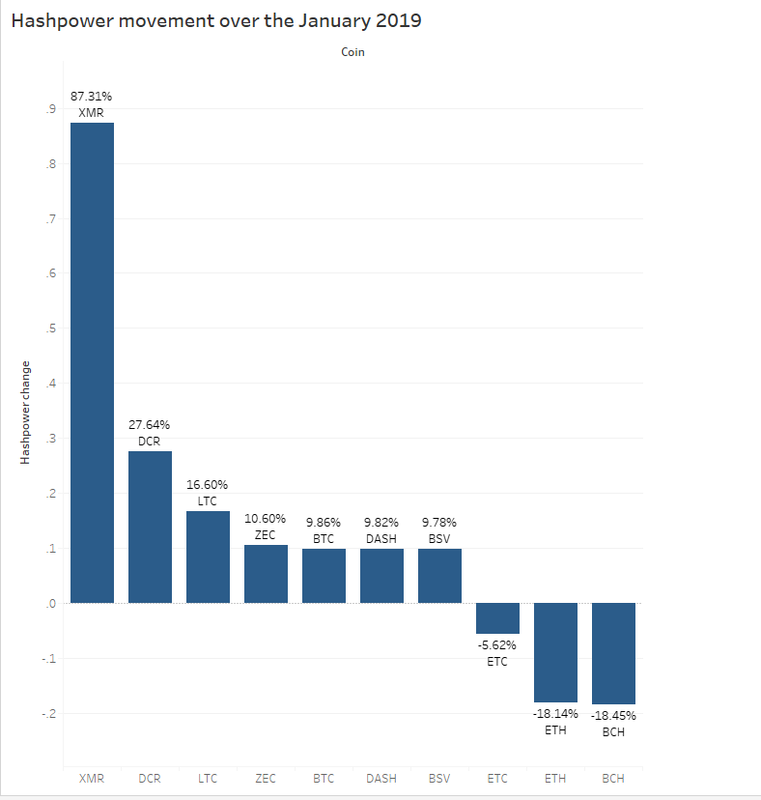 Within the January 2019, the hashpower as a whole of the top ten coins began to rebound, of which the XRM was the strongest, increased by 87%, then followed by the DCR with an increase of 28%. There were only three coins declined, among which the ETH went down for the six consecutive months due to the Consantinople and St. Petersburg Upgrades, it has fallen cumulatively 50.2% so far. However, the ZEC and DCR hashpower has been in the ascendant for 5 months in a row. In the January 2019, the prices of ASIC miners of the three major manufacturers remained basically stable, of which only the S15, T15, T9 and Z9 Antminer fell in varying degrees, and the prices of the other two manufacturers remained unchanged. In addition, a new A911 Avalon Miner launched by Canna Creative costs 1790 yuan while the miners of the Ebang international remain unchanged for 5 months. 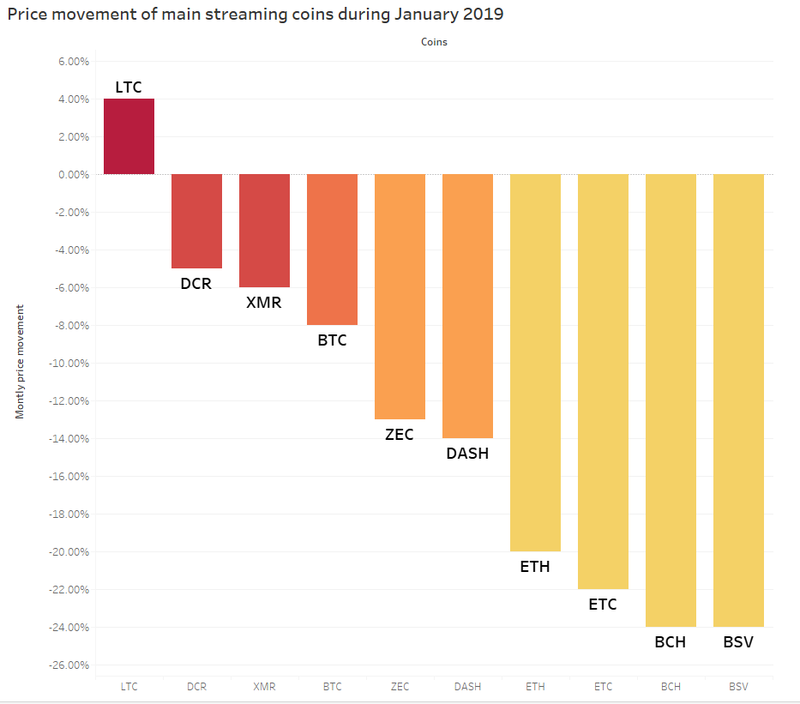 Affected by the increasing in hashpower, decreasing in coin price and other factors, the break-even period for most of the coins is getting longer, except Zec and Dash. As you can see that the shut-down mining price for ZEC is 136 yuan (around $20), which is way below the current ZEC price: 350 yuan ($51.55), which means that the Zcash cloud mining remins at the safe position. You can ontact us via our Telegram channel or leave a message to support@hash.pro if you have any inquiries.